Evening in Sherwood Forest. I’m out here because it’s been a bright, sunny day, and the evening light is set to be beautiful, and now that I’m here I’m not disappointed; not with the light at least. But I’ve come here looking to see if I can silhouette birds against that light and in particular I’d like a tawny owl - I’ve seen (and heard) them around here many times before. Tonight I’ve heard an owl hoot once, and although I’ve worked my way over to find it, I never hear it hoot again. The light fades to black, and just as I’m about to leave, a young fox cub comes out and sits in the middle of the path looking at me – it sits upright and motionless for about five minutes; it’s too dark for me to take picture, so I just wait until eventually it gets bored, picks itself up and wanders off. 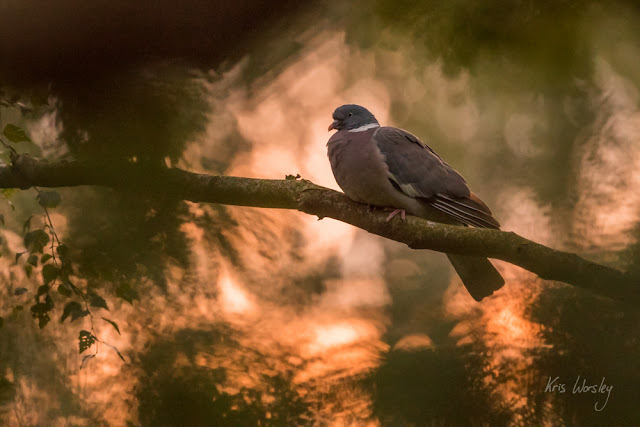 But somewhere in the middle of all that, after the single hoot of the owl and before the fading of the light, I spy a common wood pigeon sitting on a branch; plump, grey and very, very common – a rugby ball with feathers. In many ways I enjoy these challenges just as much as the more obscure and sensitive animals – I want to people to come away from my photos with a renewed sense of the extraordinary within the commonplace and the every day. In short, I want them to leave my photos and head straight for the outdoors to look for themselves with new eyes. The pigeon has its eyes fixed on me, probably wondering if it is safe to stay put or if it should move away to a different part of the forest – there’s plenty of it to move to. I see the orange light about 45 degrees to the right of the bird and I move round slowly into position to get the bird against it. Bending down, I make sure I have some green foliage of the woodland, bracken and grasses, right in front of the lens to create and mystical, diffused look across the picture. I make sure that the pigeon is positioned with a window of light behind it to highlight its round, heavy outline. I can’t use a tripod in this situation – I have to work quickly and fluidly, and adjusting the legs and repositioning the thing until the composition is right would just be too disruptive – I need to be able to make minute adjustments to the composition with ease. The camera and lens combination I’m using is just over six kilos and working handheld with it (always my preferred approach for the flexibility I gain), holding it out in front of me for minutes at a time, is quite a workout for which I need to keep fit. It’s important that I train with free weights and (in particular) make sure that I have good core strength and strong abdominal muscles so I can hold the camera steady in such strange positions. Even now, I can feel a faint tremble in my muscles as I’m holding an uncomfortable position for quite a while, adjusting the composition slightly, waiting to see if the pigeon will move or do something a little more interesting than just sit still. It doesn’t move or do anything interesting (they usually don't), so I start to play with my position, finding new windows of bright light around it to place it against, moving around to change its relationship with the structure and contours of the other trees in the wood. I play for as long as I can before the orange light fades, I enjoy the silence, the fox cub comes and goes, and—finally—I decide to leave. There’s nothing more to see tonight. Tube Strike! In praise of walking.